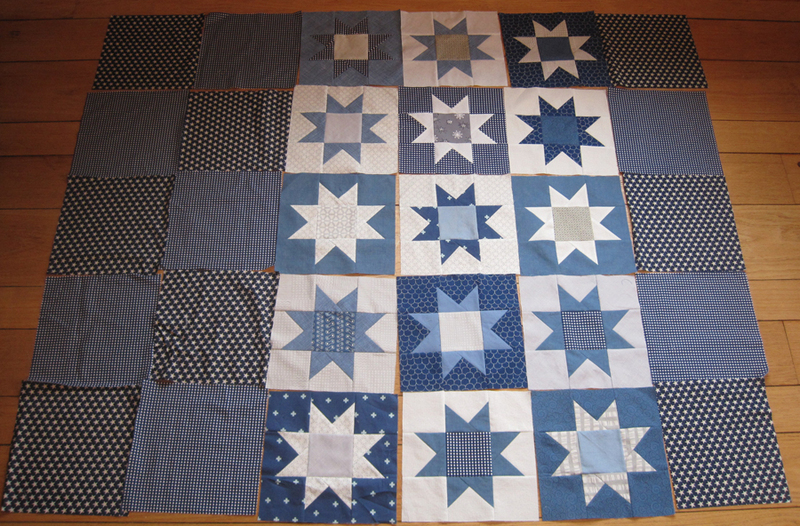 Back in January of this year, the members of the Cincinnati Modern Quilt Guild were issued a challenge to create any sewn item using improvisational piecing techniques. We had two education segments prior to the challenge to get us in the improv mood, and then we had four months to complete our pieces, which needed to include a color we were arbitrarily assigned. We were also instructed to keep our projects on the down-low so we could anonymously vote for our favorites. The May meeting was the big reveal for our challenge pieces. Each piece was assigned a number, and from the roughly 25 entries, we voted for the best use of improv, best use of our assigned color, and viewer’s choice. After the winners were announced (I didn’t win anything), everyone identified which piece was theirs and talked a bit about their process. As we came to each piece that was spread out on the tables, the maker of that piece came forward. Finally, my piece was up, and I was about to step forward . . . but then someone had to leave, so we jumped ahead to her piece. Then it was my turn . . . but something else happened, and we were delayed again. And it was like everyone in the room breathed a sigh of relief, kind of as if they weren’t sure if I knew how weird my entry was. And then they laughed. It all started when I was assigned my color: Grellow (the assigned colors were all Kona solid colors for easy identification). It wasn’t required, but I ordered a half yard of Grellow just to have a feel for the actual color. I had it sitting around my craft room for a few weeks, to give it a chance to inspire me, when I got to thinking about some fabric I received from a friend. My friend’s aunt has passed away, and my friend let me pick some pieces from her aunt’s fabric stash. 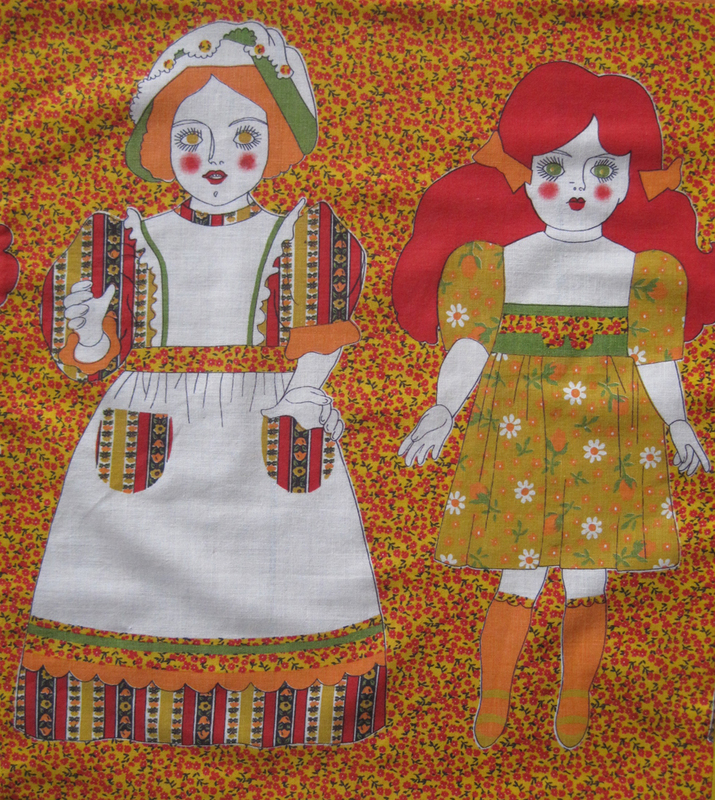 One of the pieces I took was a weird border print with dolls. 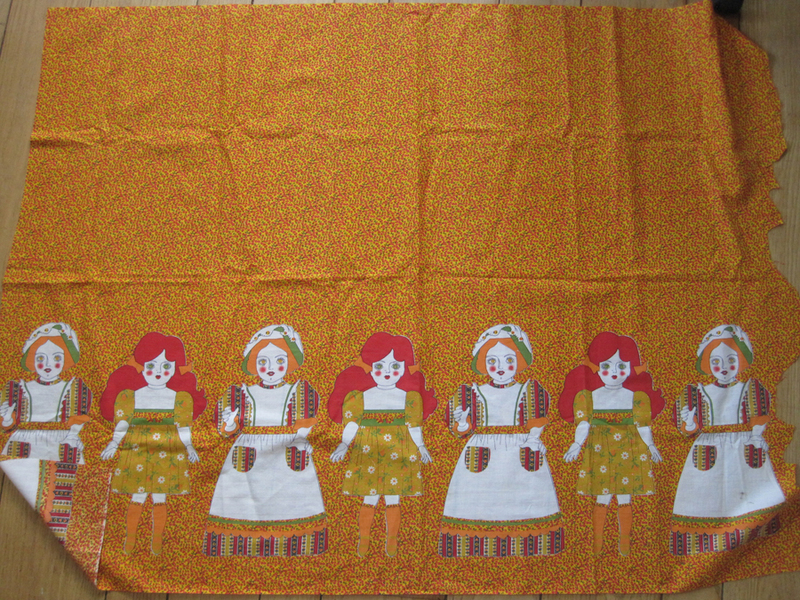 Grellow was very similar to the background color of the calico print in the creepy dolls fabric! With that realization, I became very excited about this challenge. I decided to start with a panel with two of the dolls. From there, I selected solid colors from my stash, including Grellow, to use in the border. At first, I just had Grellow, orange, green, and red, but that was crazy bright. When I asked Greg’s thoughts, he suggested I add a dark purple. What would I do without him? With my palette, I started randomly cutting and piecing sections for the border. My first sections were just strips cut with scissors. Note that I threw in some of the background calico as well. After a while I decided to jazz things up a bit with some triangles. These, too, were cut with scissors and just pieced together to fit. I trimmed my sections to 4 inches wide and pieced them together to fit around the sides of the panel. If a section wasn’t long enough to fit the panel, I’d just piece together a few more bits of fabric and sew them on to the strip. To be extra improvy, I sewed the top border on first, then the left side, the bottom, and finally the right side. With the top done, it was on to quilting. I didn’t think any color would look good for the quilting thread, so I used invisible thread for the first time. The brand I purchased was pretty much like fishing line. 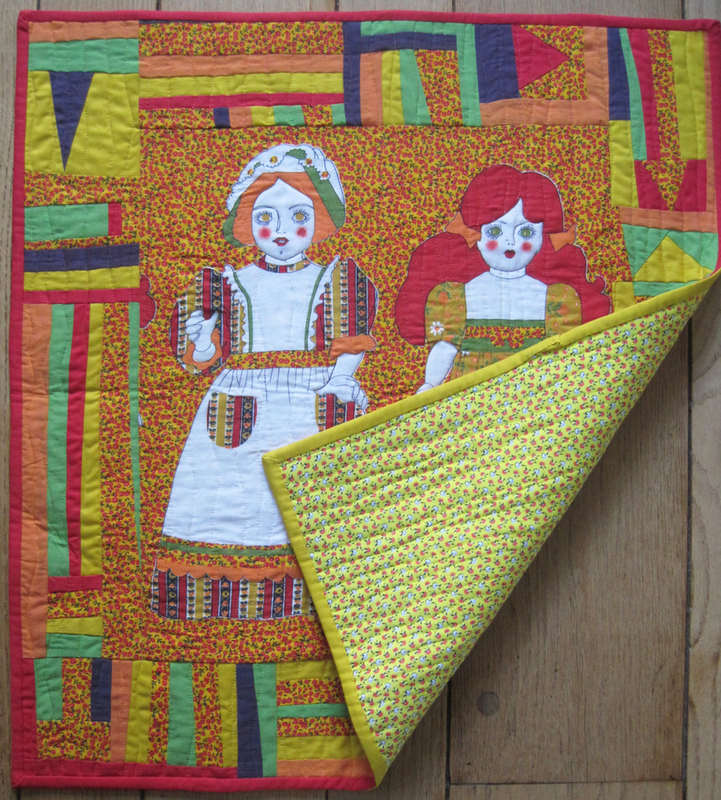 Apparently, other brands aren’t that stiff, but the stuff I had made the quilting a bit of a challenge. I used yellow thread in the bobbin. 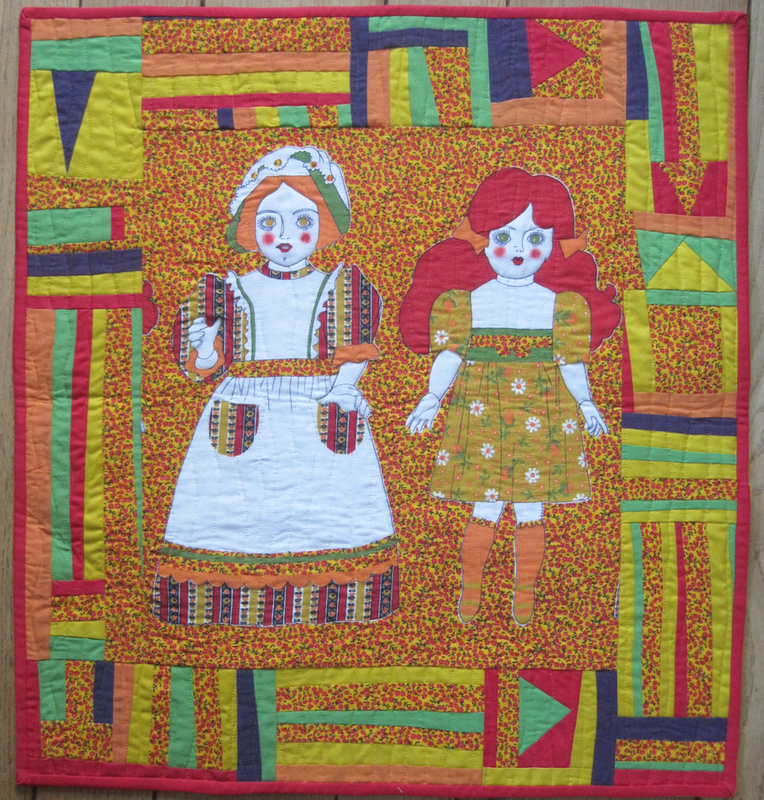 The quilting is just wavy lines from the top to the bottom. But, in an attempt to enhance the creepiness of the dolls, I quilted around their faces and hands and didn’t sew through those parts with the wavy lines. For the backing, I used another piece from my friend’s aunt. I didn’t have enough of any one fabric for the binding, so I made a two-fabric binding following the instructions in the book String Quilt Revival. The finished piece is 24 x 26 inches. I honestly thought I had a chance at one of the prizes in the improv challenge until I saw some of the other entries. They were amazing (you can see them here). But I am still really proud of this piece and its crazy colors. 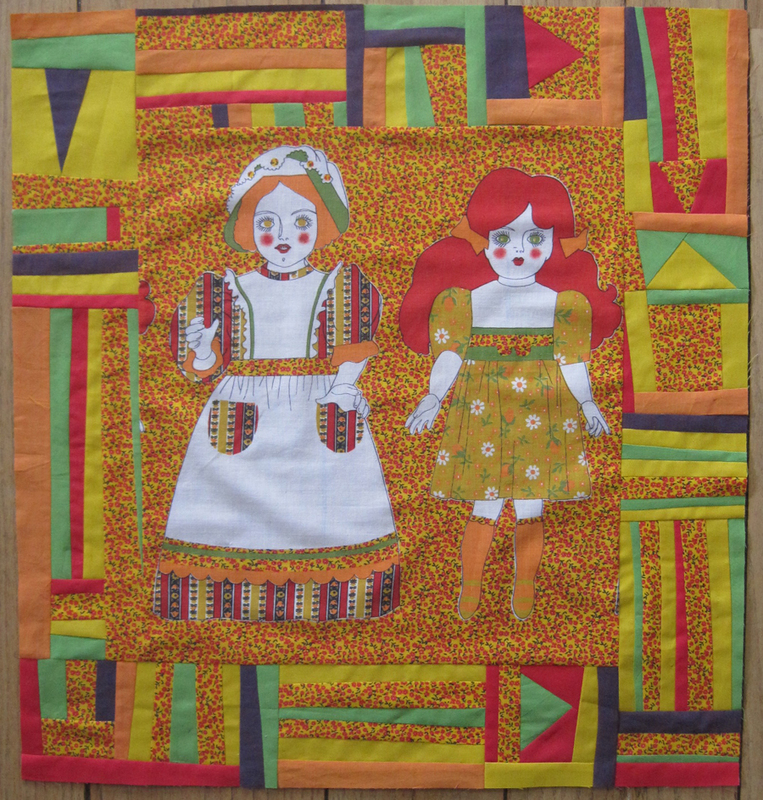 I like the way the background calico in the border blends with the doll panel. The whole piece makes me smile. 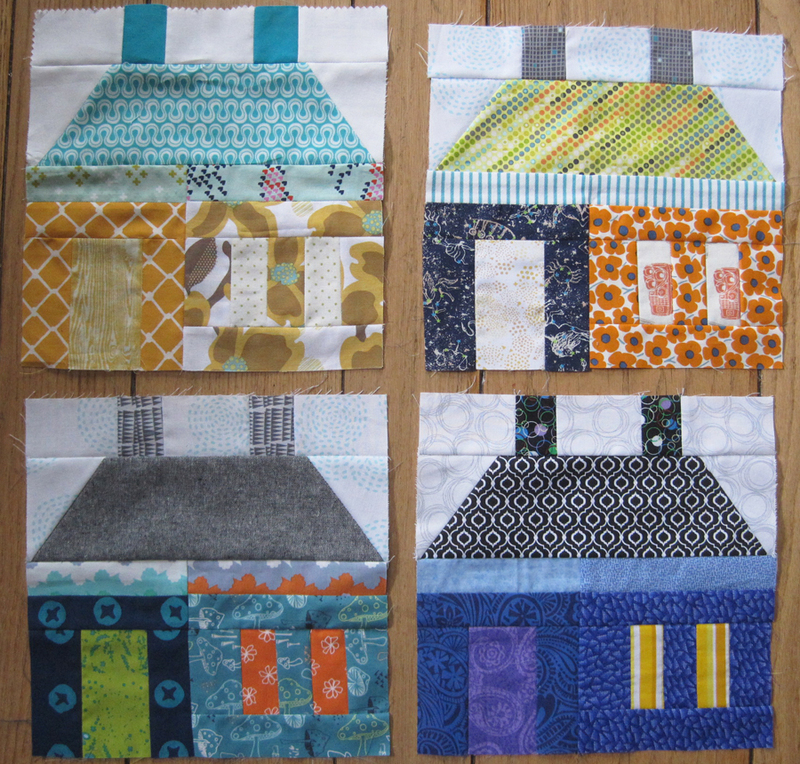 As I recently posted, I’m in a Bee Hive swap with the Cincinnati Modern Quilt Guild, and at the April meeting, I received the happy houses blocks that my hive made for me! I provided a link to the house pattern I wanted them to make, but beyond that my only instructions were to use a low-volume white for the sky and to make the houses happy. It was super fun to see what each member came up with. I was glad to see that other people had as much fun as I did picking fabrics for the windows and door. And I like that some of my hive members used colors that I normally wouldn’t have used (namely black and red); it’ll help the finished piece look more like a true collaboration. What that finished piece will be I’m not yet sure. 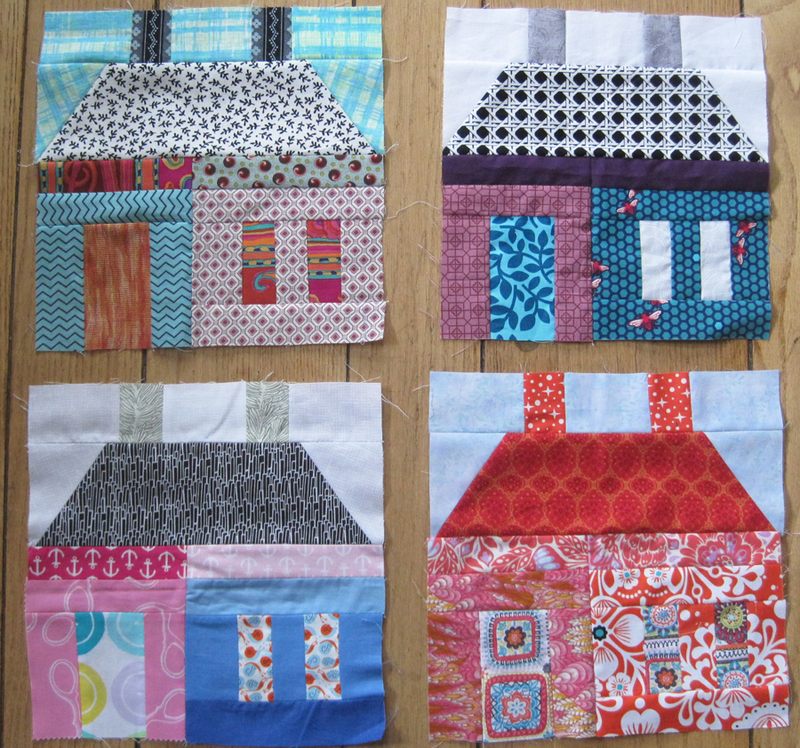 My pie-in-the-sky idea involves the houses spaced over a whole quilt top with hand-embroidered elements to tie them into a neighborhood setting. But that’s going to take some more thinking. In the meantime, I’d like to thank (in order starting with the top photo, top left house) Becky, Abby (who was sweet enough to make two blocks), Jeanie, Janine, Amy, Shona, and Tara for the blocks you made! Back in March, I posted here that 2016 was to be the year I make a quilt for the Quilts of Valor program that supplies quilts to U.S. service people. Well, the first big step—the quilt top—is complete! 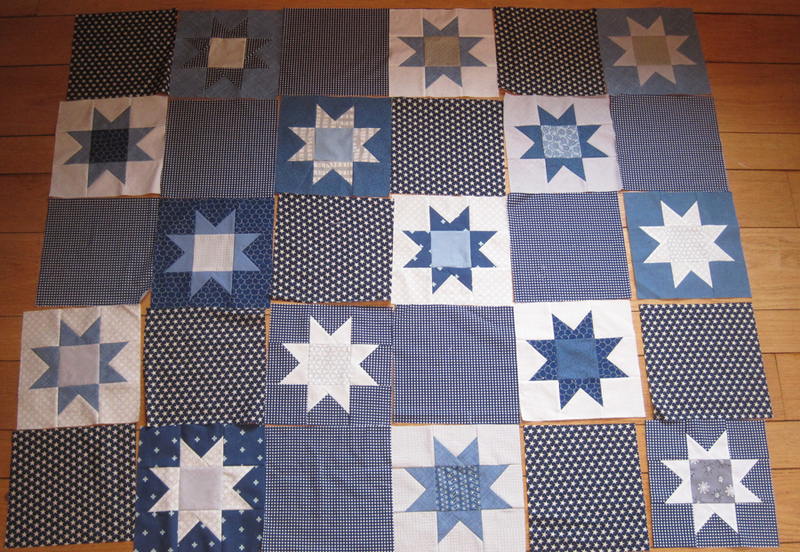 I made 24 of the star blocks using a variety of blue and gray fabrics. Then I had to figure out how to lay them out. It proved challenging. 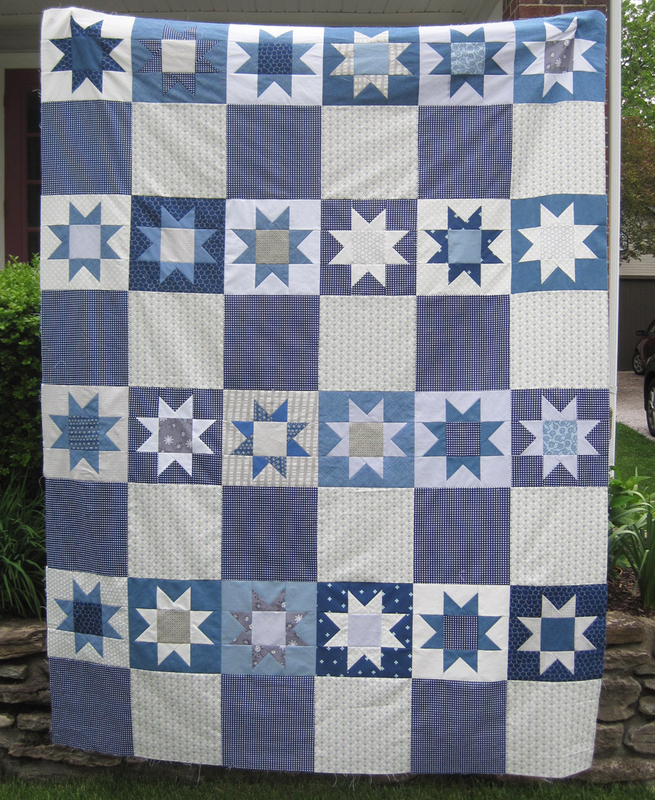 I didn’t want to make a whole quilt of the stars—that seemed to be too much. So I wanted to find a way to incorporate fabric I had with the stars. 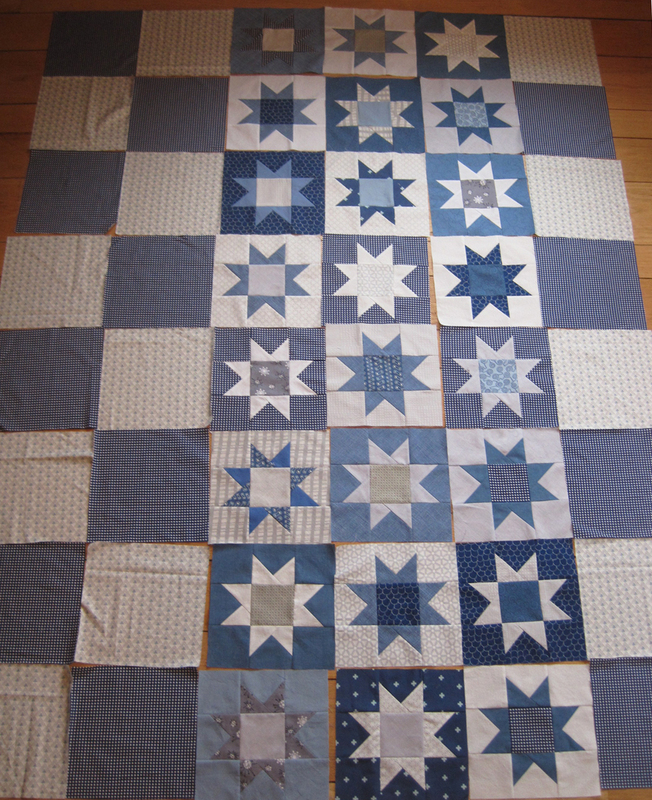 I first tried using the blue gingham that I had used in some of the stars. It was a bit too much in real life, and it looked odd with the stars that had that fabric as the background. Plus I didn’t have enough for the whole quilt. 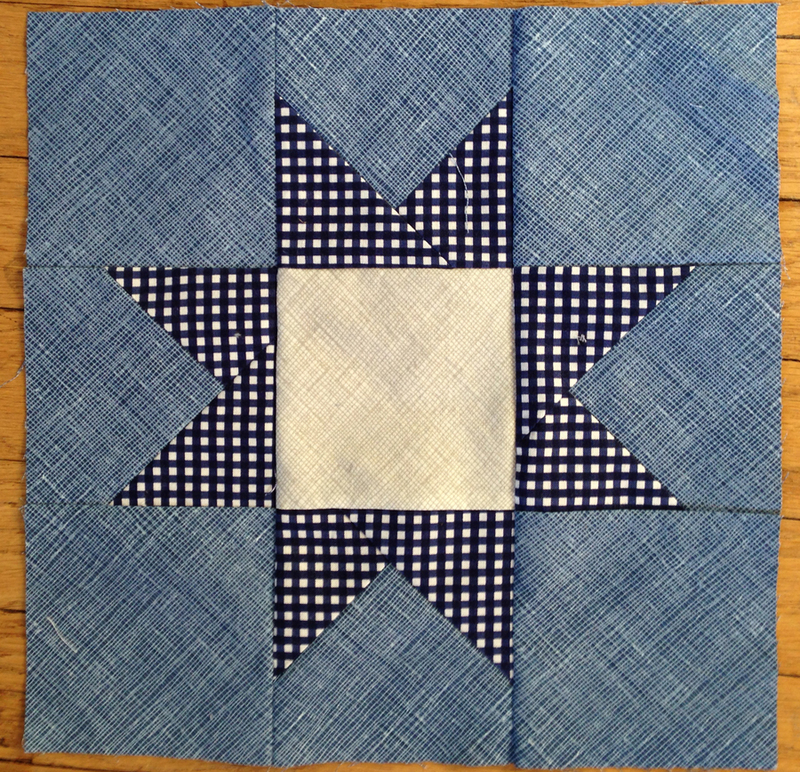 I had bought the navy star fabric especially for this project, so I tried mixing it with the blue gingham. The dark navy weighed it down a bit too much in real life. And again, the gingham touching the star blocks was a problem. Next I tried grouping the stars together, a look I liked. 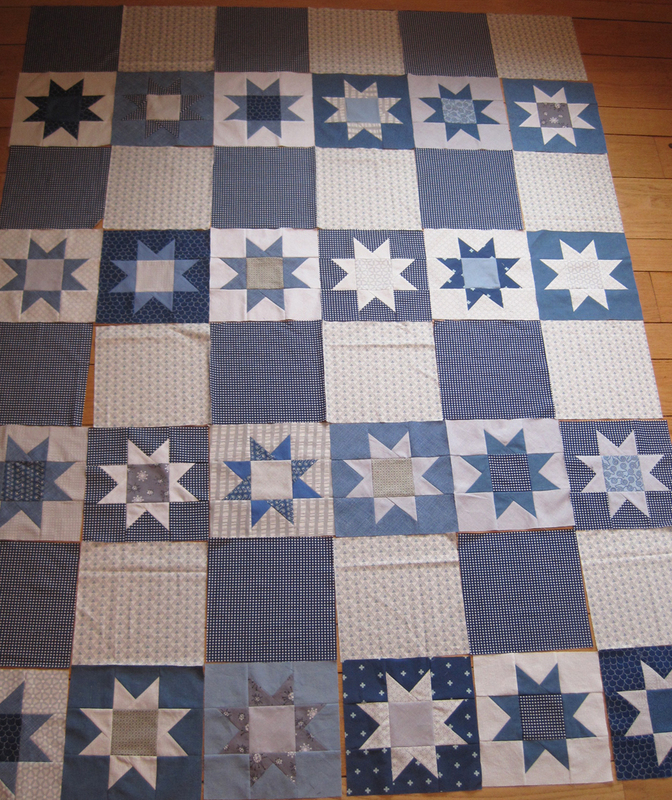 But since all my fabric was cut into 10-inch blocks, that meant my star section had to be off center. I was doing all this laying out at a once-a-month Ladies Craft Night Out event that includes some women from the Cincinnati Modern Quilt Guild. They were all offering their input on the layouts, and finally Amy suggested putting the stars in rows. Aha. 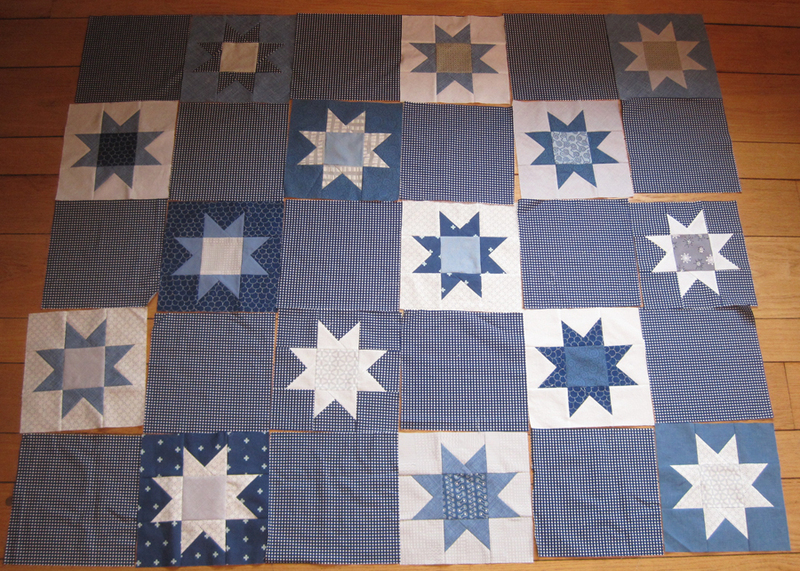 That did allow for some of the star blocks to be together, but it also gave them some breathing room. And I didn’t have to worry about gingham touching gingham. So that’s the layout I went with, and I think it works. Although, I still like the idea of having all the blocks grouped. Anyway, on to the step of making the quilt back! I’ve been playing around with that a bit, and I think I’ll try to incorporate some red into the backing for a pop of color. I have one piece of red fabric that I was considering, but the fabric was bleeding a lot, even after several rinses. Using that seemed pretty risky with a quilt with this much light fabric. More to come on this one!